Hard to believe from the photo that we were networked out after the second day at TechnologyWorld07! This time the location was Hinxton, home of the Human Genome Project, where just a day earlier there had been news of the largest study of genetics of human diseases (see Sanger Centre News item). This time Dr Jo Stanley of Anglia Ruskin joined me in supporting Richard Wishart in a packed day of meetings with the great and small from Sanyo to AuthorIT. This was in effect an International Sector activity arising from the cooperation of three members of the active networking group, HBN. We are pictured here with longstanding contact Catherine Atkins of I10, (on the right) who facilitates communication between businesses with specific technology queries and the academic might of the regions universities. We had an extremely productive day with Jo's academic expertise in IT and Digital Business Ecosystems supporting Richards Strategic role in RFID and logistics, whilst I fulfilled the role of Research director and meeting facilitator/project manager for Delivery Management. 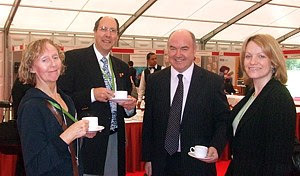 This time the buzz concentrated around the main marquee with the central coffee area surrounded by the business stands.